The Arabidopsis thaliana late embryogenesis abundant gene AtEm6 is required for normal seed development and for buffering the rate of dehydration during the latter stages of seed maturation. However, its function in salt stress tolerance is not fully understood. 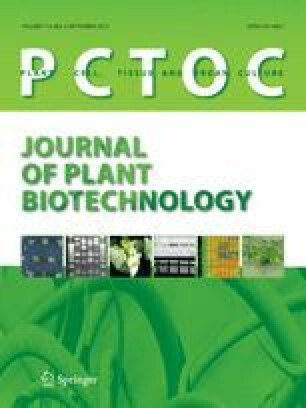 In this investigation, cell suspension cultures of three plant species rice (Oryza sativa L.), cotton (Gossypium hirsutum L.), and white pine (Pinus strobes L.) were transformed using Agrobacterium tumefaciens strain LBA4404 harboring pBI-AtEm6. Integration of the AtEm6 gene into the genome of rice, cotton, and white pine has been confirmed by polymerase chain reaction, Southern blotting, and northern blotting analyses. Three transgenic cell lines from each of O. sativa, G. hirsutum, and P. strobus were used to analyze salt stress tolerance conferred by the overexpression of the AtEm6 gene. Our results demonstrated that expression of the AtEm6 gene enhanced salt tolerance in transgenic cell lines. A decrease in lipid peroxidation and an increment in antioxidant enzymes ascorbate peroxidase, glutathione reductase and superoxide dismutase activities were observed in the transgenic cell lines, compared to the non- transgenic control. In rice, AtEM6 increased expression of Ca2+-dependent protein kinase genes OsCPK6, OsCPK9, OsCPK10, OsCPK19, OsCPK25, and OsCPK26 under treatment of salt. These results suggested that overexpression of the AtEM6 gene in transgenic cell lines improved salt stress tolerance by regulating expression of Ca2+-dependent protein kinase genes. Overexpression of the AtEM6 gene could be an alternative choice for engineering plant abiotic stress tolerance. The authors are grateful to Nicki Whitley and Ambrosia Yarn for their support in maintaining transgenic cell cultures. This work was supported by a grant from the Education Committee of Hubei Providence of China.